The Washington Wizards have a winning record for the first time since 2015, but their flaws are still apparent. 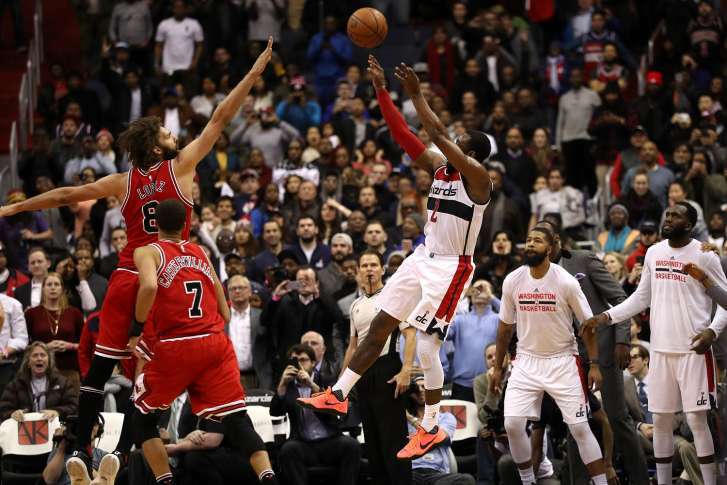 WASHINGTON — At first blush, it’s hard to know what to make of the Washington Wizards this year. After a disastrous 2-8 start, they’ve seemingly righted the ship, going 17-10 since, including a 9-4 mark in their past 13 games. Tuesday night’s come-from-behind, 101-99 victory over the Chicago Bulls at Verizon Center pushed them over .500 for the first time since 2015, but it also highlighted the fundamental flaws that remain. Both teams entered the game right at .500, but the Wizards were double-digit favorites due to a number of factors. Chicago was coming off a game the night before and playing without each of its top two scorers, Jimmy Butler and Dwyane Wade. And Washington was playing at home, where it had collected 14 of its 18 wins this season. Yet it was the Bulls that came out firing, building a double-digit first-half lead. You can chalk that up to their superior three-point shooting (they went 8-for-10 behind the arc in the first half), but the overall game trends reflect the larger issues that have plagued the Wizards all season long. Namely, their bench. John Wall was his usual, brilliant self, pouring in a game-high 26 points and dishing out 14 assists, his 21st game of 10 or more dimes this year. He also finished at a game-high +24 plus/minus, while fellow starters Otto Porter and Marci Gortat finished at +16 apiece. How, you might ask, could that be, knowing that the Wizards won by just two points? Trey Burke finished at -11 in 13 minutes; Jason Smith at -17 in 23 minutes; Sheldon McLellan at -19 in just 7 (!) minutes. Those bench numbers are stunningly bad. Sure, the Wizards are still waiting on free agent signee Ian Mahinmi to get healthy, but he’s not exactly been a difference-maker in his career thus far, averaging better than nine points and 20 minutes per game for the first time last year. And there really isn’t any more help on the way, not without a trade. The five-man lineup of Bradley Beal, Gortat, Markieff Morris, Porter and Wall is one of the best in the league with an overall plus/minus of +125, trailing only the Warriors’ and Clippers’ starting units in overall productivity. Needless to say, the support staff has not exactly matched up. Box plus/minus estimates the points per 100 possessions that a player contributes above or below a league average player, translated for a league average team. Here are Washington’s box plus/minus ratings. You could see these numbers play out in real time Tuesday night. Down eight at the half, Wall played the entire third quarter, where the Wizards outscored the Bulls 33-21 to take a four-point lead to the fourth. He rested the first 3:37 of the final quarter, in which a four-point advantage turned into a four-point deficit. He played the rest of the way, hitting the game-tying jumper in the final minute, then the go-ahead shot with just five seconds remaining. He even pulled down the final defensive rebound. With the Spurs losing at home to the Bucks Tuesday night, Washington’s 10-game home winning streak is the longest in the NBA right now, and the team’s longest since 2007. That won’t be in jeopardy Wednesday night, as the Wizards hit the road to Boston. But watch them against the Celtics, who feature seven players averaging 20 minutes or more per game. The Celtics are a much deeper club, the type of team Washington has struggled to beat, especially on the road. In fact, the Wizards have all of four road wins in 16 tries, just one of which is over a team with a winning record — a 19-18 Milwaukee Bucks team missing star Giannis Antetokounmpo this past Sunday. Even if the starting unit continues to play at the strong rate it has thus far, without major improvement from the bench, it just won’t be enough to carry the load past, perhaps, the eight seed and the right to get obliterated by the Cavs in the opening round of the playoffs.